As we are living here in Malawi we are learning so many things! Realizing we are not here just to give, but as students, learning from Jesus the lessons of life. Being stretched and seeing our own poverty (of heart) and the need for dependence upon the Father. Staying so close that we can hear His heartbeat! Jesus said "......learn from Me......"
It is very easy to become "weary in well doing" and we need to find our refuge in Him daily. 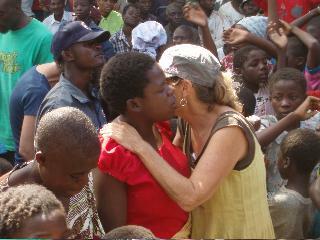 Thank you all for upholding our arms in prayer as we love on the people of Malawi!!! These are a few things that have been happening in the last two months. GOD'S HEARTBEAT... IN THE MULTITUDES, HE SEES THE ONE! May 2-5 here in Bangula we had an Iris Conference. This happens every year drawing many from the villages from near and far to come for teachings, prayer and free food! Even if they only are drawn by free food, they are hearing the Word of God! Many were saved, delivered and healed! It was a time of singing, dancing and celebration! You could hear the people from miles away!!! This is Miriam. I had the privilege to pray for her. I found her in brokenness, weeping before God, in shame and fear. Her husband is dead and has left her a widow with AIDS. The same story repeated over and over again here in Africa! By the end of the conference she was rejoicing, Jesus had set her free!!! Friday, LeRoy had the privilege of sharing with 300 pastors from different churches. They gathered under the shade of a tree hearing the message of Jesus' heart in John 17. LeRoy carries such a passion to see unity in the body of Christ which is a problem here with denominational divisions. The next day was LeRoy's 61 birthday (young at heart :) and he said seeing and hearing their response was the best present he could ever receive!!! Thank you Lord, seal those words in their hearts!!! Lord, bind us together with cords (Your love) that cannot be broken!! Many of you have asked about Mercy and her family??? God's amazing love has been pouring out on this little family! Long story short but we bought the little mud hut they call home for $90! It is on a good plot of land with several shade trees. Our plans are to build them a two room house with cement slab (instead dirt floor), fired bricks (that won't melt in the rainy season), tin roof (that won't blow away). More news on this later as it progresses. If you remember I had asked prayer for Kandiyero. He is the middle child. As you can see he has a big belly, skinny arms and legs and he had been very lethargic. At first we thought malnutrition, but we took him to two doctors and eventually were sent to Queens Hospital in Blantyre (which is an experience in itself!!! )They have been there in the hospital for 2 1/2 weeks now and just yesterday he received surgery for blocked bowels. He has had this condition for so long, but because of poverty they do not even consider going to the doctor! Yet they don't always find help there either! The medical situation here is so bad!!! Being at Queens, there is such hopelessness everywhere. Lack of doctors, medicine etc! So very sad! Does Mercy look happy or what!!! We brought her this doll from America (it is impossible to find black dolls here!!). She named it Marita (Martha) and she carries her around on her back. 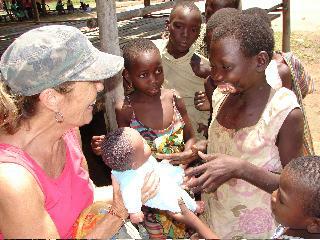 Adults and children alike marvel at Marita. They have never seen a doll that looks so real. We have not found a doctor yet for Mercy, Kondiyero became our focus for now. But on Thursday I was speaking to a friend in Blantyre and she said she has a dentist friend who wants to have a look at her. Small steps but moving forward! Her smile has already beginning from the inside out. She is a different little girl from when I first met her!!! She has been very sad this last few weeks though because she had to remain behind while the rest of the family has been in Blantyre. This has been very difficult for her! But we have been going over to the house where she is staying and visiting her and bringing them food. Please continue to pray for Mercy for God's perfect will. We received an email from a doctor who was in Zambia for two weeks who was willing to see her but we had no way to get her there in the short notice we had. This same doctor will be in Kenya in Sept. so this a possibility, but still not an easy task! Sometimes I think I would love to bring her to America so she can get the help she needs. Oh here is a funny thing I need to share with you! Her name is not Mercy! Her real name is Nurse and they pronounce it Nursey???? don't ask?? Her young sisters name is Mboy (boy)????? But I call her Mercy because that is what God is showing her and will continue to show her and her family. Also I thought she was so much younger, like maybe 10. But I think she is 12 or 13 because her body is changing :) and growing into a young lady! Learning and living by heart is not always an easy thing! We tend to "lean on our own understanding" and forget to "acknowledge Him in all our ways". But like I said we are students and sometimes fail these test of life, but the cool thing is there is no failing in the School of the Holy Spirit. You just get to take it again until you get it!!!! So we cry out each new day "Lord we need YOU, Your wisdom and discernment, guide us with Your heartbeat this day!" We can do nothing apart from Him but in Him all things are possible. So here we are in Malawi believing for "Great Big things from a Great Big God, a God of mercy!" 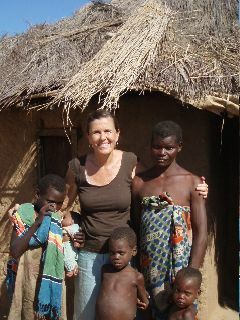 God bless each and everyone of you for partnering with us in prayer for the Malawian people. We can feel the prayer support we get and so appreciate it. Thank you very much!!! We love you!! Thanks for forwarding our newsletter to friends and family that would enjoy our mission adventure. ***Note: Don't put our name on the check, write out to KMC and put in the memo area Malawi, and it will be deposited in our account and at the end of the year you will receive a tax deductible receipt. Flood victims and provisions for them. 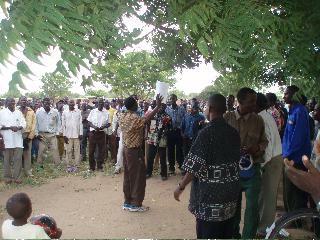 50 village pastors... to receive revelation and understanding of God's word and heart! 24 Children (here now), 24 new children soon and need for the right house parents filled with God's love! Spiritual atmosphere change over this region - OPEN HEAVEN!!!! Pour out your Spirit over this land! Note for Malawi flood food program. Please note: When sending anything to a post office box, the name or organization name must be included in the address or the post office will return it to the sender. This is a recent change resulting from homeland security issues. If you have a concern or problem with a contribution sent to our Redding office, please contact Kathy Evans, our office manager, at the above location.